Beaducation: The Blog: New resin classes coming and a giveaway today! New resin classes coming and a giveaway today! Comments are closed! We'll announce the winner shortly! 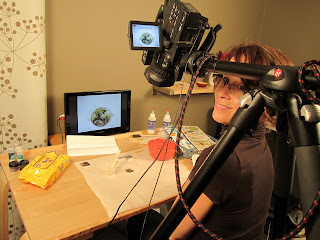 Last week at this time, we were in the "shootio" with resin guru Debbi Simon. There she is..."Hi Debbi, meet our blog readers..."
Debbi knows her resin techniques and now you will too. We have THREE great classes lined up. All of the classes use 2-Part ICE Resin. 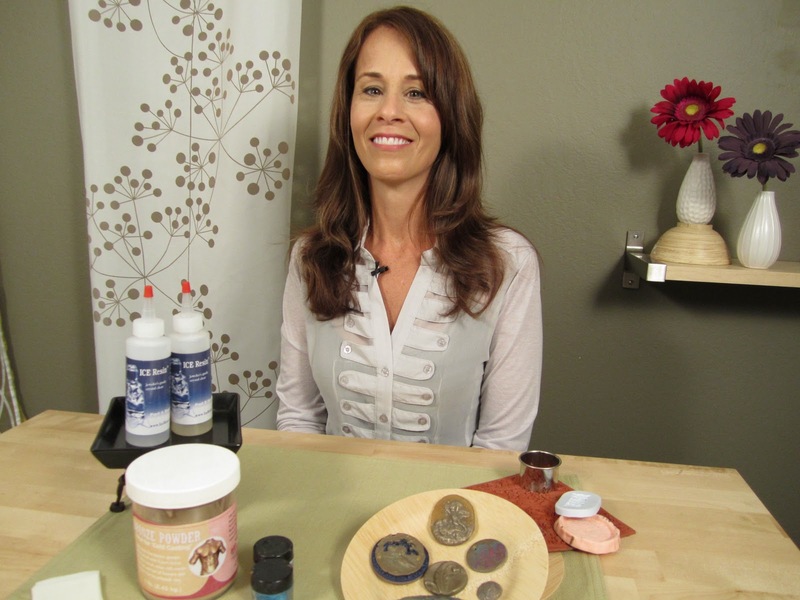 In the FREE Basics class, Debbi shows us how to use a variety of bezels and how to add color and inclusions into resin. Her attention to detail and comprehensive teaching style makes this a "must-see" for any resin enthusiast. The Mold It, Cast It class teaches us how to mold one and two-dimensional objects and cast them in resin. The Resin Foundry class gives us instruction on casting with bronze metal and resin. We are thrilled about this technique. It has so many possibilities! We filmed for three days. 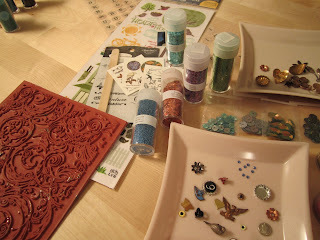 Debbi brought a plethora of stickers, glitter, charms and paint to add into our resin. She also inspired us with this collection of her own finished pieces. 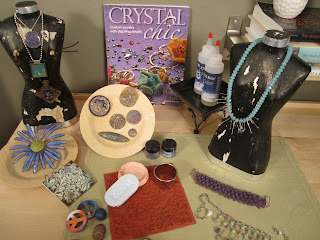 You can see her fantastic book Crystal Chic, featuring designs using Swarovski Crystals, in the photograph below. There she is on the set. Her resin classes will be available in late November. We can't wait to get them into the editing room and to add them to our selection of Online Jewelry Classes. Since we are so enamored with 'all things resin,' we thought we would host a little giveaway over the weekend. We have one of our NEW Ice Resin one-ounce packages to give away to a lucky blog reader. Our New Ice Resin is easy to use (just like the larger bottles), but this package does the measuring for you. You will be measuring cup free! Simply squeeze out equal amounts into a disposable cup, mix and pour. (More detailed directions are on the back of the package.) We'll even throw in a couple of bezels for you to try out. To enter, just leave a comment on this post, letting us know what other video classes you'd like to see on our website. We'll choose a winner by random number generator on Monday morning. We can hardly wait to find out what classes you would like us to feature in the future. See you on Monday and hope your weekend is filled with creativity and fun! making bezels from something that doesn't require soldering or metal clay! Maybe a class showing different ways to patina metal. 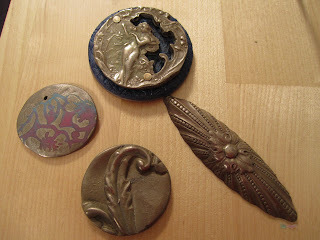 I've been reading a lot about Gilders Paste on brass stampings and heard that it can be used to color pmc too. I would like to learn the Viking knit to use on sea glass. I haven't even begun to watch all the videos I am interested in, how could I ask for more? Using resin with "found" bezels ... how to prepare them ... etc! I have yet to try the resin. It sounds intriging. Look forward to your classes. I'd love to see an engraving class. Perhaps that would be a great complement to stamping. Hand engraved swirls, curls, and dots, etc would be fun AND beautiful. The resin sounds great. I have yet to try it. Look forward to the classes for ideas and tips. I would like to see a class on resin and using inclusions. Or a class on gypsy setting small stones! Otherwise, I think the selection is very creative!! I'd love to know more about etching and enamelling. Maybe an tutorial on wire fusing:) that would be awesome..
Love beaducation so inspiring. thanks for sharing your knowledge with the rest of us! I would love to see some more fusing classes. I am thinking of returning to polymer clay and would like to learn tips on slicing canes and piercing beads without distorting them! I would like to see a video on Liver of Sulfur and polishing. I love Liver of Sulfur but can't seem to keep the areas darkened after polishing. How about kumihimo braiding instructions with beads? would love to see a fold forming class! I absolutely LOVE this giveaway. I've been interested in using resin for quite some time, but wasn't sure I wanted to spend the money on supplies for yet another technique! I've seen so many different kinds of rivets. I would love a video how to do different kinds of rivets! would like to see a class on metal disc cutting....Love the new resin dispenser. My first attempt turned out sticky. I think I will wait for the dispenser to try again. I've been commissioned to come up with a creative tie tack...I am thinking of doing one with a cut out from a vintage map encased in resin...I need this ICE! I would also love some new ideas on different ways to encase the resin; not just with a traditional bezel. A video on etching silver would be great! I'm a resinaholic and just when i think i've tried everything, someone shows me something new. my latest favorite is resin in acorn caps...the greatest! hmmmm, what would i like to see? can't think of too much that i haven't done in the areas that are of interest to me...but i'm sure you'll come up with something that will be a NEW interest! I've been wanting to dabble in resin for some time now but haven't found instructions that make sense or easy. I look forward to seeing the video. The new tool looks like it makes it easy to measure. What a fabulous idea! I think I'm more interested in the "cast it" resin how to and trying that out. 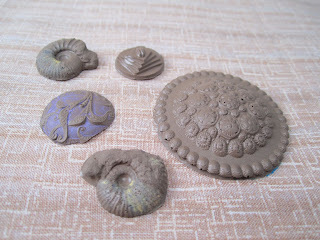 Back in the early 1970s when I was stationed in Europe I took some clay mold classes and had a ball. I still own the two lamps I made from back then. I can't wait to apply similar techniques to jewelry. I think etching would be awesome! A class on etching would be great! Maybe also some finishing/polishing/texturing techniques. How to make polymer beads. Really excited to see these ones! I'd LOVE to see a class on how to do fibula pins, and amend them in creative ways. I really like these pins but kind of don't know where to start. Adrainne said - This is the first I've heard of the 1 oz/single use resin!! I just LOVE the idea of no measuring!! Lisa, you keep bringing us the newest ideas in creating our own jewelry!! Thanks!! A class on tube riveting would be terrific. I've seen many illustrations, but I really think this is one technique I would like to see in action! I would love a class on soldering mixed metals, combining copper, silver, and the new vintaj brass blanks that you now carry. I'd like to see wire AND resin projects on video. I love that you continue to show us new and easier ways to make jewelry art. Can't wait for the resin classes - your classes are amazing! 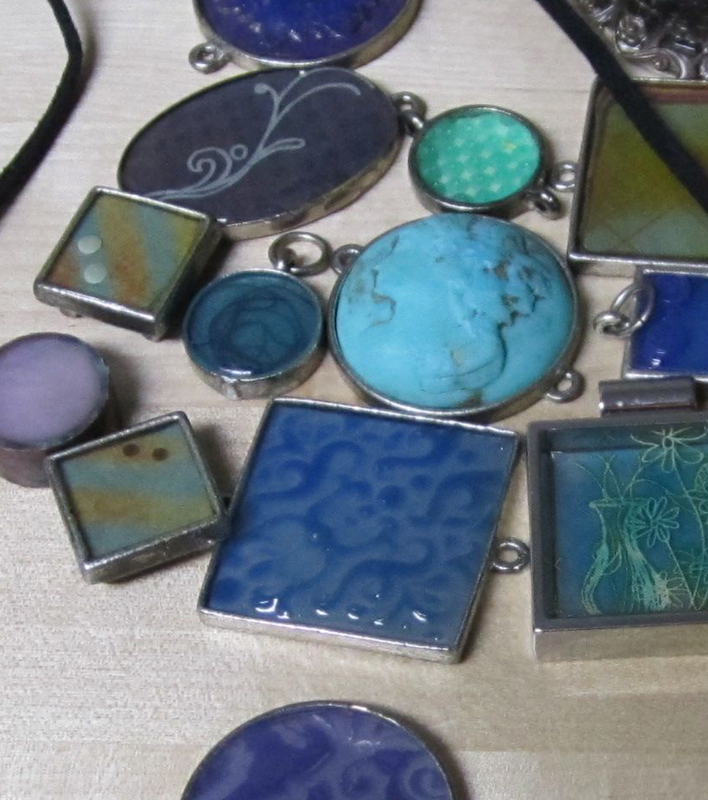 I would like to see enameling before I take a class. I would love to see a class on the herringbone technique. I've seen a class that Kriss Silva offers but, since they are too far for me to attend, I would love to see an online class. I would love to see a class on soldering for dummies. Basic info including where to purchase supplies and how to use them. I'm SO excited .. I have resin and want to learn!! Hmmm ... classes. How about color classes - how to use colors, design outside the box and such... Maybe creating your own wire bezel? Yippee!! Wow, I can't wait to see the videos! I recently purchased the Ice Resin, but have yet to crack open the bottles. I would love to learn how to do transfer images onto metal. I love all the classes you have! More cold connections! I really just adore your site. I haven't made it through all your current videos that I want to watch, but I'd love to see a silver etching class. Resins look fun! Ihaven't tried them yet but planning to! Ideas for classes. . . I would love one on how to put CZ stones into metal clay. Additional requests would be glass fusing and etching! THANKS! I love the class assortment you already offer! I would love to see etching classes and even some engraving techniques. Love your classes and your blog!!! I'd love to see a class on the Fiesta pendant that I've seen advertised for one of the getaways that I couldn't attend. I'd like to learn how to get all of the bubbles out of my resin projects. I would love to know how to use resin on flat surfaces (like tile). And perhpas a class on using sire to form cages around stone (or seaglass). I would love to know how to use resin on flat surfaces (like tile). And perhaps a class on using wire to form cages around stones (or seaglass). I can't wait to do this class. Now that I'm not working FULL time, I have time to get caught up on all the wonderful classes offered. My new home in SC even has a guest house I'm using as a jewelry studio. Let the creative juices start flowing! I really want to win your contest! I would love to see something on etching. I would love to see a class on etching. And, I would love to win your contest. I finally have some time now to start taking some classes and getting creative. No longer working full time, just moved to a new state, and now have a craft studio to work in. Yay! Definitely how to embed stones into metal. I would love to win this and learn how to use the materials I have. I think the class selections are great- I don't know where to begin, much less add more! I have a gorgeous craft room filled to the brim with supplies and no time to actually make something! Thanks for all the wonderful project ideas! Can't wait to try this...How about a class that goes over trouble shooting on several different techniques..for those of us who already know the basics on many techniques but just need a booster course. Love all the classes. Etching would be great! I have tried some resin work, but would love to do Ice Resin!! I would love to try Ice Resin!! I'm excited enough to see the resin classes I can't think of anything else to add to your class list!! I'd love to see a metal etching class!